With our Orthokeratology (Ortho-K) program, custom made, highly breathable contact lenses gently reshape the cornea during sleep to correct the vision. In the morning, the lenses are removed and you can enjoy clear vision all day long without glasses or contacts. Retainer lenses (similar to dental braces) are worn nightly to maintain the results. Our Ortho-K program is an alternative to glasses, regular contact lenses, or laser surgery. It works by reshaping your cornea (the front part of the eye) in a similar way to laser vision correction. The difference is that Ortho-K is non-surgical and non-invasive. There is no cutting, no vapourizing, it is reversible, and does not require medications. 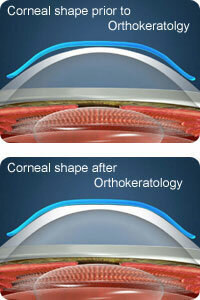 Ortho-K has been in practice since the 1950’s (about 30 years longer than Laser vision correction). Children can be treated with our Ortho-K program as long as the parent feels that the child is responsible enough to insert, remove, and maintain the Ortho-K lenses. It is especially beneficial for young school-aged children who often experience increases in nearsightedness every year. Worldwide, many children have undertaken an Ortho-K program because it has reduced or eliminated the progression of their nearsightedness. What are the main benefits of Ortho-K? Ortho-K can stop or drastically slow down your progression of nearsightedness. Your prescription should not worsen significantly while on the Ortho-K program. Ortho-K is a popular choice for patients who find that their eyeglass prescription is increasing every time they go to the eye doctor. Patients have clear vision during the day without eyeglasses or contact lenses. Ortho-K is very popular with people who are active in sports, (especially swimming), people who find contact lenses uncomfortable, and people who are simply tired of wearing glasses. It is also a good option for people who are not good candidates for laser eye surgery or who just don’t like the idea of having elective surgery on their eyes. Unlike laser surgery, Ortho-K is completely reversible if you are not happy with the results. Patients with healthy eyes and no history of injuries or ocular diseases. Patients with myopia (nearsightedness) and or astigmatism. Children who experience increases in their nearsighted prescription at every visit to the eye doctor. Is the Ortho-K program safe? Ortho-K has been in practice since the 1950’s (about 30 years longer than Laser vision correction). The risks of Ortho-K are generally the same as those of regular contact lens wear. Ortho-K has been approved by the FDA and Health Canada as well as the health and medical regulatory bodies of most major countries. A doctor needs to initiate and supervise orthokeratology treatment to ensure the cornea is measured properly and accurately, that the lenses are doing their job properly, that the eyes are adapting well to the lenses, and that there is no risk of damage being done. 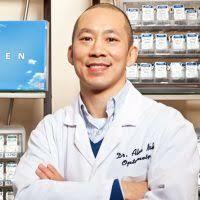 Doctor supervised orthokeratology has proven to be very safe and effective. Our Ortho-K program includes regular eye health check-ups that are included in the program fee. A complementary screening and consultation is available to see if you are a good candidate for our Ortho-K program. Please call us for more information at 905-948-0050.